“Versailles 31.7.1918.” A group of allied soldiers photographed at Versailles, Paris, include British, Scottish, Canadian, Australian, New Zealander and French Troops. The three civilians present are likely the photographer and his associates. The above photograph is a much treasured souvenir brought back from the First World War by Private Ivan Carman Clendinnen, my grandfather. He enlisted in the Canadian overseas expeditionary force in April of 1917, a couple of months following his eighteenth birthday. By July, Ivan was at the Front Line with the 38th Battalion, 4th Canadian Division, and 12th Canadian Infantry Brigade. A year later he was on leave in Paris at which time this photo was taken. It is extraordinary this picture survives given that, upon his return to the Front Line, he was shot in the chest, mustard gassed, and later developed pneumonia. Ivan was fortunate in that unlike so many, he was able to come home in diminished yet reasonable health. 4th Canadian Division, 12th Canadian Infantry Brigade. 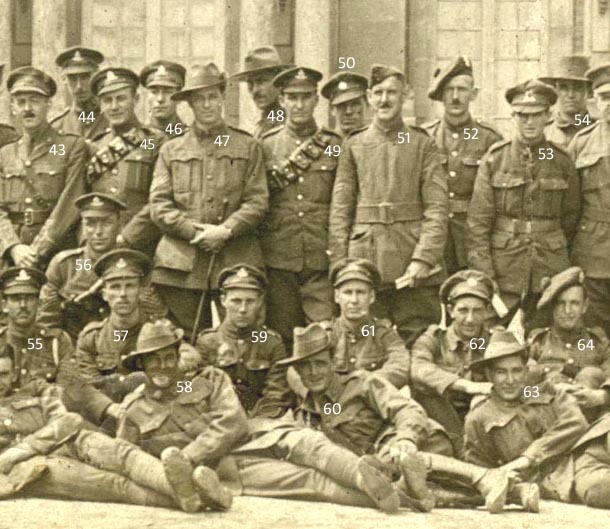 Curiosity has drawn me to research and develop this webpage in the hope of identifying the allied soldiers and civilians in this photograph. Its form will include short biographies on the individual soldiers such as is recorded below for Pte. I. C. Clendinnen. I would appreciate any clues and input from my readers. 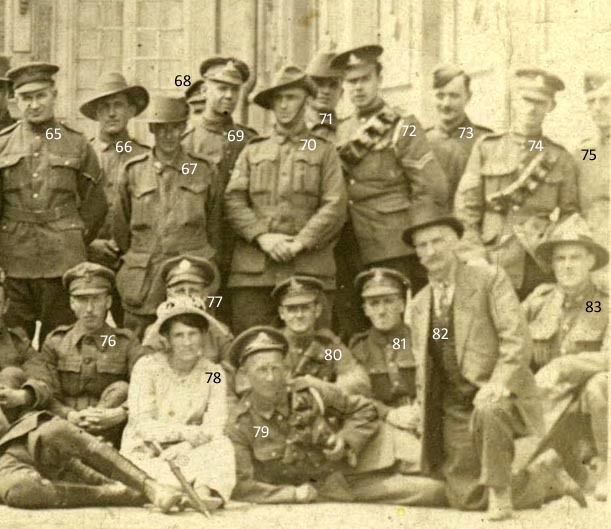 Despite damage to the picture, there are only two soldiers whose faces are unclear [Nos. 1 & 58.] and two soldiers who are out of view, having been positioned behind others [Nos. 68 & 77.] I have Photoshoped the first ‘Versailles’ image in order to clarify it. The original photograph is found at the end of this project. What follows are four close-up sections from the photograph followed by a list of some obvious or questionable details about each individual in that section. 1. Soldier wearing a British service dress cap. Damage to the photograph obscures his face. The detail at left is from another surviving print made from the original negative, courtesy Kete Christchurch. 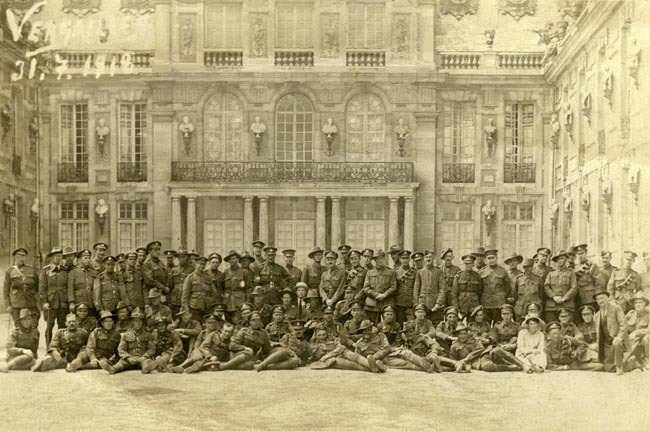 Source: Detail “Group at Versailles, 31 July 1918”, Judge Family papers, Kete Christchurch. 2. Australian Sergeant wearing a Slouch hat. 3. Soldier wearing a U.S. Cavalry Campaign hat? or an Australian Slouch hat? 4. Soldier wearing a British service dress cap. 5. Soldier wearing a British service dress cap. 6. Corporal [two chevrons on the right sleeve] wearing a British service dress cap. 7. Canadian Pte. Ivan Carman Clendinnen, Regimental No. 2043057. Born January 1st, 1899, Ivan enlisted a few months after his eighteenth birthday in the 3rd Divisional Ammunition Column in Kingston, Ontario, on April 9th, 1917. By April 24th he embarked for England aboard the S.S. Olympic. Taken on strength with the 38th Battalion, Canadian Expeditionary Force (4th Canadian Division, 12th Canadian Infantry Brigade,) he arrived in France July 12th, 1917 and left for the field by the end of the month. At this time the 38th Battalion was on the Front Line near Avion. Further Battles they participated in include Passchendaele Ridge, Amiens, and Droucourt-Queant. Ivan was granted a ten day leave in Paris, during which time the Versailles photo was taken. By August 10th 1918 he had returned to the field. The Canadian Troops were preparing to fight what would be one of their most bitter and costly battles of the Hindenburg Line: the Battle of the Canal du Nord, September 27th to October 1st. During and after the capturing of Bourlon Woods, the 38th Battalion experienced severe losses en route to Cambrai and was withdrawn. It was at this time, on September 30th, Ivan was shot in the chest, and mustard gassed. His wound was dressed the next day at a field station and from there he was advanced to No. 4 Casualty Clearing Station at Baulencourt; and on to General Hospital No. 22 at Camiers where he developed pneumonia. Invalided to Seaford, England on October 12th, 1918, he was admitted to No. 16 Canadian General Hospital in Kent. 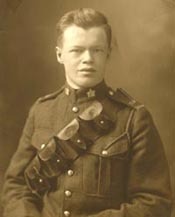 Ivan later returned home aboard the S.S. Carmania and was discharged in Ottawa on January 27th, 1919. The family story is that Ivan was inspired to become a doctor while carrying the wounded by stretcher from the Front Line. Upon his return to Canada, he studied medicine at McGill University, Montreal and went into practice as a doctor and surgeon. He returned to Europe in 1939, serving in World War II, as a Captain attached to a medical field ambulance. He eventually moved up the ranks to Lieutenant Colonel and took command of a field dressing station in Sicily and Italy. In 1945 he returned to private practice as a general surgeon in Hamilton, Ontario, where he died on September 5th, 1955, at the age 56. He and his wife, Jessie Keith Craig are buried in Woodland Cemetery, Hamilton. Sources: Ivan C. Clendinnen portrait, ca. 1917. Collection of Judith Ann Clendinnen Heuff, in possession of the author; War Diaries – 38thCanadian Infantry Battalion (LAC/on-line); J.F.B. Livesay. 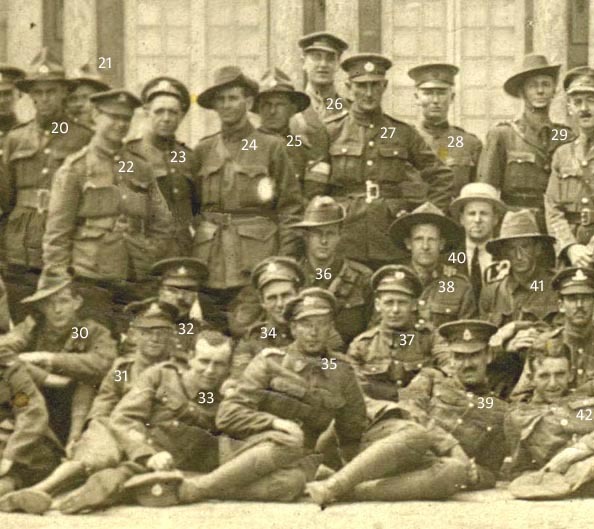 Canada’s Hundred Days: With the Canadian Corps from Amiens to Mons, Aug. 8-Nov. 11, 1918. (Toronto: Thomas Allen. 1919); Military File: Ivan Carman Clendinnen No. 2043057, LAC/RG 150, Acc. 1992-93/166, Box 1793-31; “Dr. 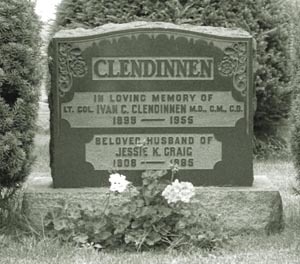 I. C. Clendinnen Resumes Practice.” Hamilton Spectator, 19 Jul 1945 (On-line/War Museum/Democracy at War); Photograph of Clendinnen tombstone, Woodland Cemetery, Hamilton, Ontario, 1990. Photographer Lee Dickson. 8. Corporal [two chevrons on the right sleeve] wearing a British service dress cap. 9. Soldier wearing a British service dress cap. 10. Corporal [two chevrons on the right sleeve] wearing a British service dress cap. 11. Soldier wearing a British service dress cap. 12. Australian? Soldier wearing a Slouch hat. 13. Soldier with no distinguishable cap visible. 14. Soldier wearing a British soft trench hat. 15. Australian Soldier wearing a Slouch hat. 16. Australian Soldier wearing a Slouch hat. 17. 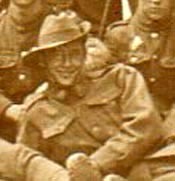 New Zealand Corporal [two chevrons on the left and right sleeves] wearing a Slouch hat. 18. Australian Soldier wearing a Slouch hat. 19. New Zealand Soldier wearing a Slouch hat and ammunition bandolier. 20. New Zealand Soldier wearing a Slouch hat. 21. New Zealand Soldier wearing a Slouch hat. 22. Soldier wearing a British soft trench hat. 23. Soldier wearing a British service dress cap. 24. Australian Soldier wearing a Slouch hat. 25. New Zealand Soldier wearing a Slouch hat. 26. Soldier wearing a British soft trench hat. 27. Soldier wearing a British service dress cap and two bands on the right arm. 28. Soldier wearing a British service dress cap. 29. Australian Soldier wearing a Slouch hat. 30. Australian Soldier wearing a Slouch hat. 31. Soldier wearing a British soft trench hat. 32. Soldier wearing a British service dress cap. 33. Soldier holding a British soft trench hat. 34. 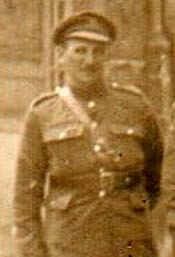 Sergeant [three chevrons on the right sleeve] wearing a British soft trench hat. 35. Soldier wearing a British soft trench hat. 36. Australian Soldier wearing a Slouch hat. 37. Soldier wearing a British soft trench hat. 38. English Pte. Arthur William Judge served in the New Zealand Medical Corps...A short biography is forthcoming. Sources: Portrait of Arthur William Judge, Judge Family papers, Kete Christchurch; Biography of Arthur William Judge, Kete Christchurch. 39. Soldier wearing a British service dress cap. 40. Civilian man wearing a Skimmer hat, perhaps the photographer? 41. Soldier wearing a U.S. Cavalry Campaign hat? or an Australian Slouch hat? 42. Scottish Soldier holding a Tam o’Shanter. 43. Officer [decoration on the sleeves] wearing a British service dress cap. 44. Soldier wearing a British service dress cap. 45. Soldier wearing a British service dress cap and ammunition bandolier. 46. Soldier wearing a British service dress cap. 47. 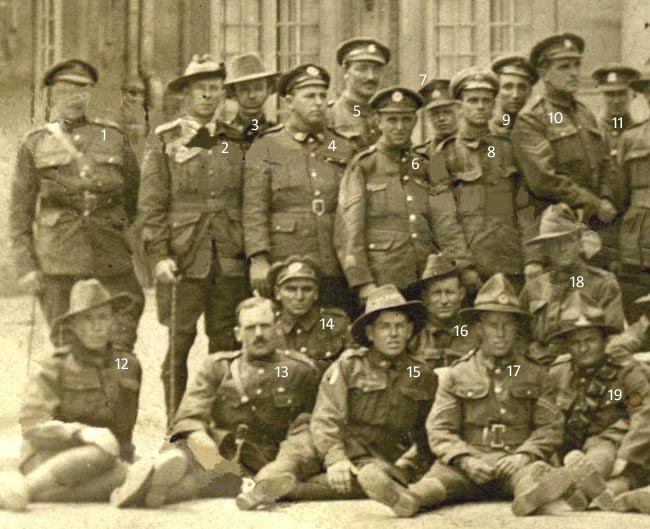 Australian Sergeant [three chevrons on the right sleeve] wearing a Slouch hat. 48. Australian Soldier wearing a Slouch hat. 49. Soldier wearing an ammunition bandolier. 50. Soldier wearing a British service dress cap. 52. Scottish Soldier wearing a Tam o’Shanter. 53. Soldier wearing a British soft trench hat. 54. Australian Soldier wearing a Slouch hat? 55. Sergeant wearing a British service dress cap. 56. Soldier wearing a British service dress cap. 57. Soldier wearing a British service dress cap. 58. Australian Soldier wearing a Slouch hat. Damage to the photograph obscures a portion of his face. The detail at left is from another surviving print made from the original negative, courtesy Kete Christchurch. 59. Soldier wearing a British soft trench hat. 60. Australian Soldier wearing a Slouch hat. 61. Soldier wearing a British soft trench hat. 62. Soldier wearing a British soft trench hat. 63. Australian Soldier wearing a Slouch hat. 64. Scottish Soldier wearing a Tam o’Shanter. 65. Lance-Corporal [one chevron on the left sleeve] wearing a British service dress cap. 66. Australian Soldier wearing a Slouch hat. 67. Australian Soldier wearing a Slouch hat. 68. Soldier wearing a British service dress cap. His face is obscured. 69. Soldier wearing a British service dress cap. 70. Australian Soldier wearing a Slouch hat. 71. French? Soldier wearing a French Infantry side cap? 72. 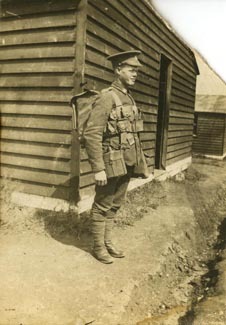 Corporal [two chevrons on the left sleeve] wearing a British service dress cap and ammunition bandolier. 73. French? or American? Soldier wearing a small cap. 74. Soldier wearing a British service dress cap and ammunition bandolier. 75. French? or American? Soldier wearing a small cap. 76. Soldier wearing a British service dress cap. 77. Soldier wearing a British service dress cap. His face is obscured. 78. Civilian woman, perhaps the photographer’s associate or a soldier’s wife? 79. Soldier wearing a British service dress cap and ammunition bandolier. 80. Soldier wearing a British service dress cap. 81. Soldier wearing a British service dress cap. 82. 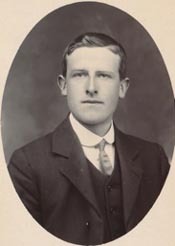 Elderly civilian gentleman wearing a bowler hat, perhaps an associate of the photographer? 83. New Zealand Soldier wearing a Slouch hat. 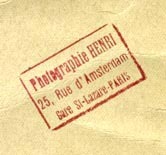 Photographer's stamp on the reverse side of the photograph. A review of Google maps, shows No. 25 Rue d’Amsterdam survives intact from the early 1900’s, likely it was built in the late 1800’s. It is a five story Neo-Classical building with ground floor store fronts and upstairs apartments. The windows are fitted with French doors and Juliet balconies. 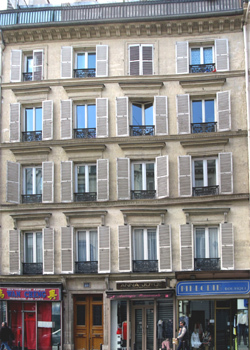 It is adjacent to the St. Lazare train station. At present, no further details have been found about “Photographie Henri.” It must have been a lucrative business during war time: photographing soldiers on leave in Paris, as other photographs have been spotted on-line. No. 25 Rue d’Amsterdam. Photograph courtesy Jerzy Galecki, 2016. Sources: Three similar photographs of soldiers dated August 1918 can be viewed on-line at Bruce County Military History, http://military.brucemuseum.ca, in the “A992.020.001 Roy Eidt Photo Album.” The gentleman in the Skimmer hat appears in all the photographs. The gentleman in the bowler hat appears in one photo from the album. The three above mentioned photographs were taken between August 13th and 16th, 1918. 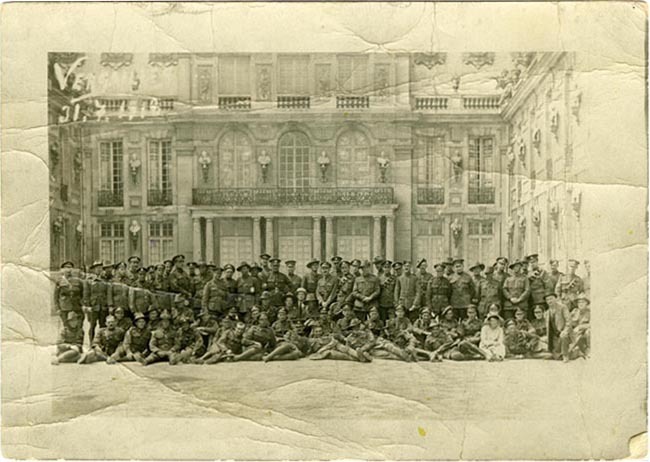 “Versailles 31.7.1918.” Including its generous border, the photograph measures 5 1/8 " x 7 1/8" (13 cm x 18 cm) Collection of Judith Ann Clendinnen Heuff, in possession of the author.